It’s almost time to celebrate Earth Day in the speech therapy room! Earth Day occurs on April 22nd each year. 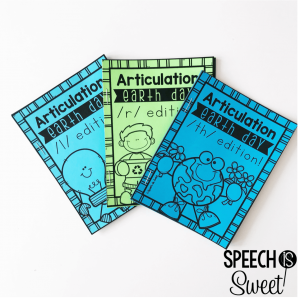 I decided to whip up a special edition of my articulation vocabulary books to celebrate! This is an exclusive freebie for my email subscribers! Join my community to gain access to this freebie and more! I have been obsessed with articulation vocabulary books for some time! They’re perfect for beginning readers or articulation students that are working at the sentence or basic reading level! 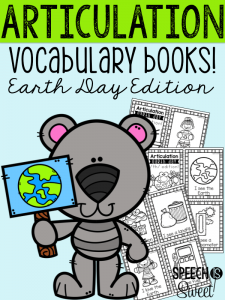 These books feature two carrier phrases, “I see…” and “I can…” with an Earth Day themed vocabulary word. They’re such a great way to incorporate vocabulary and reading into articulation therapy. These ensure a high number of repetitions, as students will re-read these books throughout their therapy session. This will also help enhance their reading fluency! I love activities that can target a wide variety of skills! This freebie features three different books – /l/ edition, /r/ edition, and /th/ edition. Throughout therapy students will be engaged with constructing and coloring their books. These also double as homework! Students will be so proud to take these home to read to their family members. Practice at the word level, sentence level, or reading level! They’re great for mixed groups! Language students can compare/contrast items in the books. Students can describe items in the books. These are a great way to practice reading fluency. Print on white paper so that students can color the pages! Did I mention that these are no prep? Yes! No prep is definitely needed in April! haha! Sign up for my newsletter to snag this freebie! If you enjoy these books, I have two different bundles available! The seasonal bundle features spring, summer, fall, and winter booklets. There is also a thematic bundle that features five fun themes: transportation, animals, food, home, and school. « Earth Day Books for Speech Therapy!